The clinic is multidisciplinary and includes a senior pediatrician, speech therapist, physiotherapist, developmental psychologist, occupational therapist, and a dietician. The clinic offers evaluation and treatment of children, and their families, with feeding disorders caused by medical, developmental or emotional issues. The children come from a wide variety of backgrounds and sectors. 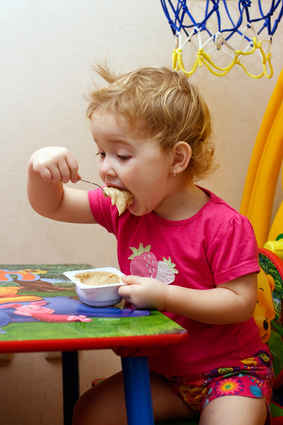 What feeding disorders are treated at our clinic? Feeding disorders resulting from medical disorders such as reflux, neurological diseases, syndromes and developmental delay. Difficulty in transition to solid food from bottle feeding or nursing. Slow growth or poor nutritional status. The clinic evaluation includes a thorough medical exam and feeding or eating observation by the staff. Children are referred for different types of treatment including medical follow-up, medical specialist consults, eating therapy (by speech therapists), developmental therapy, nutritional follow up, psychological counseling and support. As Israel’s leading treatment facility for weaning from enteral feeding, babies and children from all over the country are referred for treatment at ALYN. ALYN recently produced an informative video guide for the use of parents, grandparents and caretakers. Staff members at the Feeding Rehabilitation Center explain how to feed babies and infants, which foods should be introduced and what behaviors are to be expected during feeding time. The video also offers some important encouraging tips and instructions on how to deal with resistance during feeding time.